The Tabernacle consisted of a framework of 48 boards overlaid with gold. These 48 boards stood in 96 sockets of silver and were braced by 5 bars on each of its three sides. Click on the controls below to set up the framework. 15 Then you shall make the boards for the tabernacle of acacia wood, standing upright. 16 Ten cubits shall be the length of each board and one and a half cubits the width of each board. The Boards were made of acacia wood overlaid with gold. Each was 10 cubits (15 feet) in height and 1.5 cubits (2.25 feet) in width. 17 There shall be two tenons for each board, fitted to one another; thus you shall do for all the boards of the tabernacle. The Hebrew word for "tenons" is literally "hands". Two tenons were at the underside of each board. Each board were fitted into two silver sockets (bases). Each socket weighed one talent (approximately 100 lbs). Together, the 96 sockets provided a strong foundation for the Tabernacle. 18 You shall make the boards for the tabernacle: twenty boards for the south side. 22 For the rear of the tabernacle, to the west, you shall make six boards. There were twenty Boards on each of the north and south sides and six boards on the west side of the Tabernacle. All 46 boards were made identical. 23 You shall make two boards for the corners of the tabernacle at the rear. 24 They shall be double beneath, and together they shall be complete to its top to the first ring; thus it shall be with both of them: they shall form the two corners. 25 There shall be eight boards with their sockets of silver, sixteen sockets; two sockets under one board and two sockets under another board. At the two corners at the rear, the setup was different. Two boards were made for each corner, thus a total of four boards. The corner boards, however, were to be coupled together by a ring at the top. The two corner boards, plus 6 boards, totaling 8 boards at the west end. The Bible does not describe in details how the corner boards were made, and there were different opinions on its setup. The 3D model below shows one possibility. Click on the boards and sockets to move them, or use the following controls. 27 and five bars for the boards of the other side of the tabernacle, and five bars for the boards of the side of the tabernacle for the rear side to the west. 28 The middle bar in the center of the boards shall pass through from end to end. 29 You shall overlay the boards with gold and make their rings of gold as holders for the bars; and you shall overlay the bars with gold. 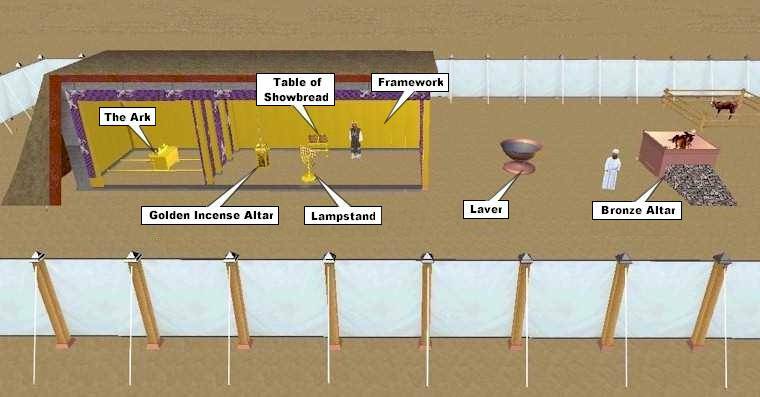 On each side of the Tabernacle there were 5 bars of acacia wood overlaid with gold. These bars were inserted through rings of gold attached to the boards. As they were inserted, they would hold the boards together firmly. Without these bars the Tabernacle would be unstable and would be susceptible to every desert wind that came up. Exactly how the bars were positioned on each side we do not know. A popular view shows two short bars across the top parallel to two short bars across the bottom, with a central bar running the full length of the side. Of interest is the central bar. The Scripture says that "the middle bar in the center of the boards shall pass through from end to end" (Exodus 26:28). Some suggest that this bar ran through a hole in the middle of each board. I rejected this idea because it would not add to the stability of the structure and would actually weaken the board itself. It would also require some precision tools to drill a hole through a relatively thin board. Such tools may not be available to the Israelites in the desert. 30 Then you shall erect the tabernacle according to its plan which you have been shown in the mountain.